Scouting is a community. No matter the size of your Council, Area or Group, and regardless of the region you reside in, there is always a network of support to be found within the Scouts Canada family. Since 2002, the York Headwaters Area in Shining Waters Council has hosted monthly Scouters’ Club meetings to engage local Groups. Hosted by the Service Team and led by the Area Commissioner, representatives from each Group—namely youth, Scouters and Group Commissioners—have the opportunity to socialize, address topics related to Sections, and discuss information from the Area, Council and National levels. “Scouters’ Club is a cornerstone for the engagement, teamwork and success that the Area has had so far,” claims Alyssa McGinnis, the York Headwaters Area Support Manager. The Area boasts an average Group size of 65-70 youth, and has noted steady membership growth over the past 9 years, with a current youth retention rate of 70%, according to Area Commissioner, Kit Cheng. Scouters’ Club is a cornerstone for the engagement, teamwork and success that the Area has had so far. According to Alyssa, the in-person interaction at each Scouters’ Club meeting allows Scouters to share and socialize in a more personal setting, allowing feedback and information to be exchanged and discussed directly. For each Scouters’ Club meeting, both adults and youth Commissioners present joint reports, and the topic of focus alternates monthly to cover membership registration, recruitment, Safe Scouting and more. After presentations are given to update the Area, the Scouters’ Club arranges breakout sessions to give everyone the chance to speak openly in smaller clusters, air concerns and receive support. “We’re always taking feedback, and the breakouts are a good opportunity to hear what Groups are having challenges and successes with. It’s a great chance to share best practices too,” Alyssa adds. One issue that the Scouters’ Club was able to collectively address was training for new Scouters. While York Headwaters has a youth membership of 1,932, their waitlist includes 420 youth. “Groups don’t feel comfortable taking more youth without more Scouters to help supervise,” Kit explains. “Last year we emailed parents of youth on the waitlist to let them know that if they volunteered, it would guarantee a spot for their youth.” Of the 500 parents emailed, 40 became volunteers, in part due to the email blast. “We also heard from a lot of Groups at Scouters’ Club that, while they have a lot of Scouters, the Scouters are newer. We want to build that confidence and skillset so that they can build their capacity to welcome new youth,” Kit continues. This feedback resulted in the Area’s latest strategy for recruiting and engaging Scouters—an outdoor skills workshop. Covering activities like camp site cooking and pitching a tent, this workshop will allow experienced Scouters to teach newly recruited Scouters important skills. “This will give new Scouters the confidence to accept more youth,” Kit affirms. Within the communal atmosphere of the Scouters’ Club meetings, the Area leadership works alongside Scouters, youth and Commissioners to ensure a joint review of Area and Group progress. Beyond providing a support and a social network for Scouters, the Scouters’ Club also sees active engagement from Scouting youth. 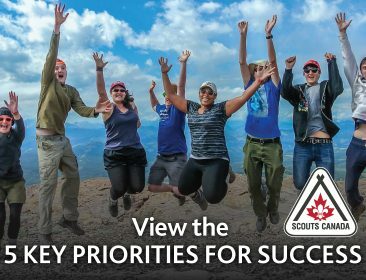 So far, York Headwaters Area’s positive experience with the Scouters’ Club has resulted in feedback that translates effectively into positive change. According to Kit, the first step in arranging a Scouters’ Club for your Area is building trust.